Part nuts-and-bolts guide, part reflection on the wiles of marketing and those of us who fall for them, The Classical Angler has written a fascinating account of how slow-action fly rods were usurped by the busy-bee tempo of the stiff, modern counterpart and how they are gradually making a comeback. Finally, I know that a stiff rod with slow action is not an oxymoron. 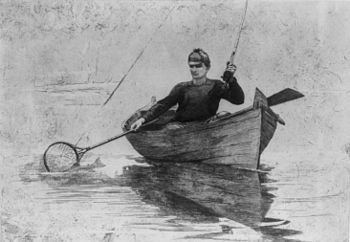 Flyfishing is lucky in this respect, for on a very different sporting playground, I once experimented with a couple of wooden-headed golf clubs that I suspect had been built not long after hickory was replaced by metal when it came to the club’s shaft. Slow-action? Reach the top of your backswing with those whippy antiques and you could have poured yourself a Martini in the time it took for the clubhead to embark languidly on its return journey. Had I ever been able to make the club’s unwinding coincide with the head’s impact with the ball, I’m sure the latter would have travelled some way but it was a timing exercise tantamount to catching lightning in a bottle. With the exception of a few nostalgics who continue to play with hickory-shafted clubs for old times’ sake, golf’s past is past where clubs are concerned, yet fly anglers can still switch from one generation of rod manufacture to another and find their fishing enhanced for more than merely sentimental reasons, as The Classical Angler has explained so inspiringly. “Now the generation of anglers that have never tasted this wine need to have the courage to question things, and pick up a rod like the Orvis Superfine Touch or Superfine Glass, and see what has been hidden behind the yellow curtain all these years. “The blanks on a fly rod is designed to bend and is charged with energy during casting. On traditional rods the handle is glued to the blanks precisely where the power potential is greatest. It goes without saying that a handle that is glued with hardening adhesive to the bottom portion of the blanks inhibits tensioning. This simple fact was the starting point for ArcticSilver’s product development. We wanted to create a rod where the blank’s entire power potential could be exploited. We ran ArcticSilver’s thinking past three men who are no stranger to the form and function of fly rods: rod-builders David Norwich and Chris Ward and casting instructor Mike Marshall. ‘Underwhelmed’ would be a fair summary of their initial reaction. “The mechanics and physics don’t add up to any valid improvement in fly rod design,” said Norwich. “Other than an unusual (ugly?) design for the handle, it doesn’t say much about the rod blank construction or overall performance. Changing the handle configuration is going to do nothing if the basic blank is poorly designed. They talk in very insubstantial ways about the blanks, as though all fly rod blanks will benefit from using their system. I just don’t see how. “They do not state how or where the blank is held into the new ‘grip system’. Consider how a blank can rotate/twist/turn during a cast. On this new system is the blank a push fit in the grip? Or is it glued into the grip to stop it twisting? Answer that and you will know how much of a benefit the idea has. Clearly, on their video, the grips are longitudinal segments from the reel seat to an end point, and clearly the hand holds these segments ‘closed’ on to the blank during the ‘grip’. What cannot be ascertained from a video alone, however, is the question of how durable the grip material is, whether the blank moving around in the upper elements of the segments will wear the grip from the inside out, or whether there is a risk of pieces of hand/skin/finger getting caught between the segments as your hand grips them. I’m sure they’re all champing at the bit as trout season approaches Down Under but this…?! I’m relieved to hear it. This is precisely why my own spear stays indoors at least until Easter’s behind us. Do click on the link within the article, to photos of a slightly nonplussed Game Officer, Anthony van Dorp, in ‘Maasai warrior’ mode. This was inevitable the moment Tenkara hit a mass audience, I suppose. You come up with one way of short-circuiting the process and it’s only a matter of time before the envelope gets pushed even further. We’re now effectively down to a rod with a sharp end, no reel and no fly. And a whole new meaning to the the term ‘New Zealand-style‘.